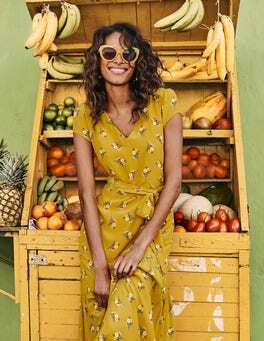 With a subtle tiered hem and panels in contrasting hotchpotch prints, this midi dress brings boho up to date. It features a relaxed crew neck and simple three-quarter-length sleeves, in a fabric blend that flows effortlessly. Wear with loose hair and casual boots. 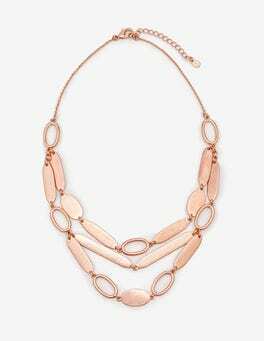 Hanging from your neck like a chain of glistening leaves, this eye-catching necklace features not one, but two tiers of antique finish metal shapes to dress up your décolletage. Don't be deceived – this versatile piece looks just as good with a simple top as it does with a LBD. This floaty dress passes our (highly official) 3 F's test: it's floral, feminine and fabulous. The flowery print makes it just the thing for a garden party and the V-neck and cap sleeves ensure it's sophisticated. The asymmetric, tiered hem is what upgrades this from a want-it to a need-it piece. It's all in the details with this sleeveless dress – there's the smart stand collar, feminine back tie and tiered skirt. Made from a lightweight linen blend in a semi-fitted yet flattering shape, this is a warm-weather winner. Get ready to slip into your next wardrobe wonder. This flowing maxi dress is made from crinkle viscose and comes with a tie belt for a defined waist. Brunch in the AM and dinner in the PM? Between the stylish tiered skirt and smart buttoned front, you're set for all occasions. We love lace, so we dedicated this midi dress to it. The sheer, three-quarter-length sleeves have a feminine feel that's boosted by the delicate cutwork detailing on the bodice, waistline and tiered hem. All it needs now is heels and a special occasion. We've pulled out all the stops with the in-house-designed print on this linen dress. This piece has a fit-and-flare shape and tiered detailing on the skirt but it's the back, with a cut-out section, that we're really excited about. 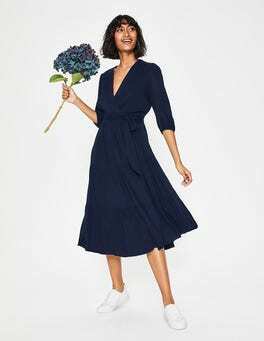 This wrap midi dress is all about boho luxe, right down to the floaty tiered skirt, three-quarter-length sleeves and crinkle viscose fabric. Like a personal touch? The handy tie waist means it fits to your shape. As for shoes, go for heels or flats – it loves both.